First, let's address the name Elias Isaac Plott, which has been randomly and wrongfully given to George's father by family members since about 1900. There has never been proof that George Plott's father was Elias Isaac Plott. George and Margaret's seventh child (their third son) was Elias Plott. He married Charity Conrad. Elias and Charity's first son was named Rudolph Conrad Plott after her father Rudolph Conrad. Their second son was Elias Wagner Plott, who told his family that he was named after a grandmother. This would be Elias' mother Margaret. Her maiden name was most likely, Wagner. Elias Wagner Plott was named after his great grandfather, Elias Wagner. Then, we would say that the name Elias came from Margaret's side of the family, not George's. The historical archive documents are proving that George's father was "Johann Görg Plott" until documentation is found and/or released. Now, let's look at the documentation for George's father, Johann Görg Plott. The earliest known archival level record for our Plott family is a 1741 manumission register, which was originally kept in the Meisenheim, Germany district office. A manumission releases a person in a serf position from an overlord. A serf was a person, who was bound to an overlord for whatever reason; including, living on and working a parcel of land for the overlord, working off a debt to an overlord, etc. In return the overlord would also provide the serf with protection under his rule. A serf and serfdom was part of the feudalism system. ​This 1741 manumission register proves that Görg Plott, Sr., age about thirty-six years old, had to be released by an overlord as a subject from serfdom. What were Görg, Sr.'s duties or circumstances to find himself bound to an overlord? This 1741 manumission register does not state what Görg Plott, Sr.'s job duties were. I remind everyone that I am a document based family researcher. We need to continue to seek a document for what Görg Plott's serfdom circumstances were to his "overlord". On the 1741 manumission register, the list of names were written by the same person with the same handwriting. The names were not signatures of the persons. I want to pause here for a moment to mention that I have heard and read several hypothetical stories of folks trying to mentally figure out, mentally resolve or mentally compose logical narrations on how George Plott came to America with the Plott Hounds. Speculators have offered a scandalous version that George Plott and a brother left Germany, in haste, because of their ill-doings or misfortune of owing money to someone in their local German community. One incognito hypothesis suggested that “George Plott (or Johannes) some think he changed his name to George when he had to pay off a note for a friend. (That was considered a disgrace at that time.)”. Another thievery tall tale, which has been circulated for many years, is that the boys stole the hounds and voyaged off to America. Some folks have dramatized like in the movies or an adventurous novel that George and his brother must not have had sufficient funds to pay for their voyage to America; therefore, they found cheap voyage on a ship with a captain and crew of poor reputations; like a slave trading ship or a pirate ship. Some of the stories also suggest that George and his brother worked on a ship for passage to America or the boys were indentured servants. These scenarios come from folks imaginations and their failure to research archival information, which is and has been available for all to view for over two hundred and seventy-five years. Through research, we now know that George’s father, Görg Plott, legally asked his overseeing Lord and officials, if he and his family could be released from serfdom to move to America. Görg’s request was approved and recorded in the 1741 Manumission register. The Görg Plott family, including George Plott and his brothers, left Germany proper and legal. During this time, George Plott (Junior), who moved to North Carolina, was a young boy of about five to six years old. Did people in the Meisenheim or Callbach region leave without the overseeing Lord or officials approval? Yes, in fact, on the 1741 Manumission register, it was recorded, "Joh. Hüll, who left by night". Mr. Hull did not obtain his full serfdom release; however, the registrar recorded Mr. Hull’s action of leaving by night. At this time, we do not know what happened to Mr. Hull, if anything. 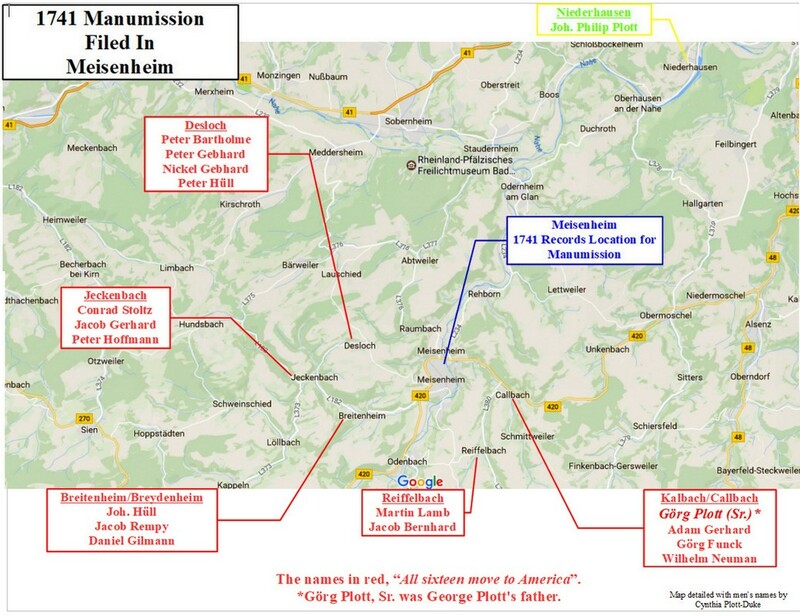 ​This 1741 Manumission is found at www.familysearch.com, film number 250235, Manumissionsprotokolle, 1724-1749, Authors: Zweibrücken (Bayern : Herzogtum). Amtsgericht (Main Author), Format: Manuscript/Manuscript on Film, Language: German, Publication: Salt Lake City, Utah : Gefilmt durch The Genealogical Society of Utah, 1959, Physical: 1 Mikrofilmrolle ; 35 mm. 1741 Manumission - Request to leave serfdom from overlord to move to America. Görg Plott from Kalbach/Callbach. Please take note of the "bracket" of the sixteen men's names in the center of the page. Görg Plott was the first name listed at the top of the "bracket" of sixteen men. The following information was provided by Michael Palmer, "the original is located: Landesarchiv Speyer, Bestand [ = Record Group] B 2/4607, fol. 92v. See http://www.archivdatenbank.lha-rlp.de/speyer/a/a.3/b2/ (the bibliography provides useful references to the history, administration, and geography of the duchy of Pfalz-Zweibrücken in the 18th century)." During this historical feudal time period, typically, a serf or laborer would have had to pay for their release from the overlord. To the date of this writing, we do not have documentation that Görg Plott, Sr. had to pay for his and/or his families release or an amount of payment. But, if we pause for a moment and think about Görg Plott, Sr.'s financial situation, we realize that he had to have had ample funds. He was not in dire straits, as some folks have mentally concluded and discussed over the years. First, most likely, he had to have paid for his release and obtained a manumission. Second, he had to pay for travel, lodging, food and voyage expenses to America for himself, his wife Philippina, his daughter Margaret, his sons Fredrick, George Jr., Jacob & a son, who was to have died at sea and some Plott hounds. Third, he had to have had funds to set up living accommodations once the family arrived in America. The family members were not indentured servants. So, Görg Plott, Sr. must have had saved a reasonable measure of funds. ​Has any information about Görg Plott, Sr.'s financial status been found or suggested? Yes. In April, 2017, a book by Rev. 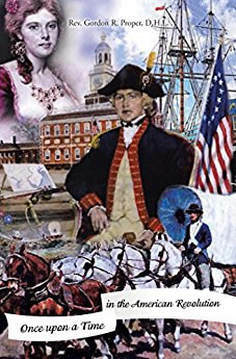 Gordon R. Proper, "Once Upon a Time in the American Revolution" was published. In his book Rev. Proper wrote, "The Marlborough was exclusively for the wealthy. Everyone on board had money and paid well for their passage and special accommodations. They consisted of young married people, with their children." 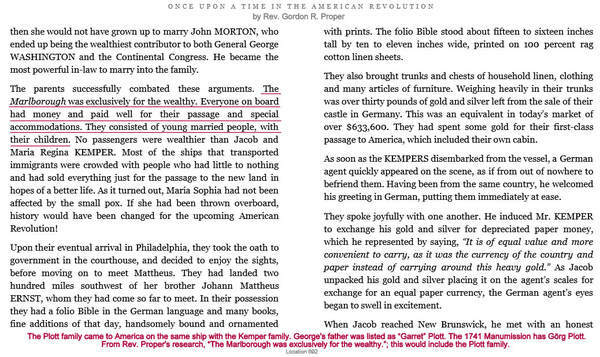 The Plott family came to America on the same ship Marlborough as did the Kemper family, whom Rev. Proper wrote about. The ship Marlborough arrived in Philadelphia on September 23, 1741 with the Ship Master Thomas Bell. Thus, we presume that Rev. Proper's information would include Görg Plott, Sr. and family. There are two parts of Rev. Proper's information that are of interest to us. First, "The Marlborough was exclusively for the wealthy." Using Rev. Proper's statement, the Görg Plott, Sr. family would have had the financial means to pay for his release from the overlord, voyage and accommodations once the family was in America. Second, "They consisted of young married people, with their children." Our family story states that George came to America with one or two brothers and a brother, who died at sea. For George to have been a young boy with brothers coming to America, logically, parents would have had to accompany them; "young married people". At this time, we have found George's parents: Johann Görg and Philippina Plott. So far, we have found the children to be: Margaret (born circa 1730 in Germany), Fredrick (born circa 1732 in Germany), ?Brother died at sea? (born circa 1734 in Germany), George (born circa 1736 in Germany), Jacob (born circa 1740 in Germany) and Adam (born circa 1742 in America). Rev. Proper's information and the information provided by Daniel Plott, son of George and Margaret Plott, to Dr. Engelmann give support to validate the other. ​These are more puzzle pieces of our Plott Family story fitting into place. If you wish a copy of the book, Amazon . com sells it in Kindle, hardback and paperback forms. ​What all can we learn from the Meisenheim Manumission Register? 1. The element in our Plott family story that George, Jr.'s father worked for a "lord" is true. Görg Plott, Sr., in fact, had requested and was granted a manumission release from his overlord. Who was his overlord or lord? At this time, I haven't gotten that far in my research. I do not know the name or names of who the overlord or lord were. 2. The year 1741 was clearly written at the top of the manumission page. This is the same year that the ship Marlborough landed in Philadelphia. 3. We clearly learn the spelling of our greatx grandfather's name, Görg Plott. His name was not Jorgen, Jonathan, Elias, or Elias Isaac. Also, we learn that the earliest record found to this date, the surname was spelled, Plott. There was no "s" or "z" at the end of the name, as many people have suggested since the early 1900s. 3. Görg Plott was the first name listed in a "bracket" of sixteen men. The scriber wrote that all sixteen men were moving to America. This comment indicates that the overlord acknowledged that all sixteen men, including Görg Plott were given permission to move to America; except for "Joh. Hüll, who left by night" . 4. Within the sixteen bracketed names, Görg Plott was also grouped with three other men: Adam Gerhard, Adam Funck and Wilhelm Neuman. The scriber wrote that these four men were from Kalbach (current spelling Callbach). As of the date of this writing, the earliest residence location for the Plott family was in Callbach, Germany. 5. All of the villages that the sixteen men listed in the bracketed section declared can be found on a modern map and are in close vicinity to the others. The villages listed were Callbach/Kalbach, Reiffelbach, Desloch, Breitenheim/Breydenheim and Jeckenbach. 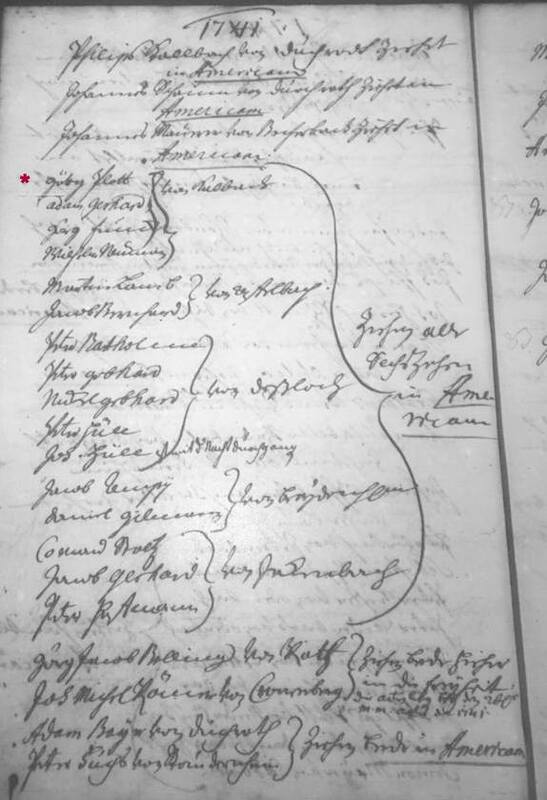 A transcribed list of the mens names can be found in the book, "Eighteenth Century Emigrants, Volume II, The Western Palatinate" by Annette Kunselman Burgert, which is on page 372, 1741 "Görg Plott, Adam Gerhard, Görg Funck, Wilhelm Neuman of Kalbach . . . move to America". This page in Annette Kunselman Burgert's book, "Eighteenth Century Emigrants, Volume II, The Western Palatinate" came for the above 1741 Manumission record. Which Kalbach was the 1741 Manumission document referring to? Let me pause here to provide you with an example of how a researcher should not be afraid to ask for help. Excitedly, I saw the village name Kalbach on the 1741 Manumission and immediately looked on a Germany map for Kalbach. I found a Kalbach next to Fulda, which did not seem logical to me. Rhetorical question, why would a person from northeast of Frankfurt travel to Meisenheim to request a manumission? There were so many duchies, lords, overlords, etc. It did not make sense. On the internet, I found a website for OberKalbach, Hessen, Germany, which is the work of Ursula Foster. I emailed Ms. Foster to inquire about the Kalbach area. She was from the Fulda area and knows it well. She advised, "That Kalbach was not a town in the 1700's. This Kalbach was organized from 7 villages in 1971. I am very familiar with the surnames of the Kalbach villages and there are no Plotts there." Ms. Foster sugguested, "Kalbach of your ancestor is now part of Frankfurt am Main". Ms. Foster reported back, "I looked at the second microfilm today and found no Plott names in it" for the Kalbach, Frankfurt am Main. At this point, I am comprehending that there is a variable to the name Kalbach that I need a circa 1741 Germany map and additional help. As I have mentioned before, modern technology is of tremendous help. I posted on a "German Genealogy" Facebook Group, "I am looking for where Kalbach was located in 1741; not modern Kalbach. I need a map circa 1741 that would pinpoint Kalbach of 1741. The attached is a manumission registry, which logs Görg Plott from Kalbach. Does anyone have ideas for map circa 1741 with village names? Meisenheim office. 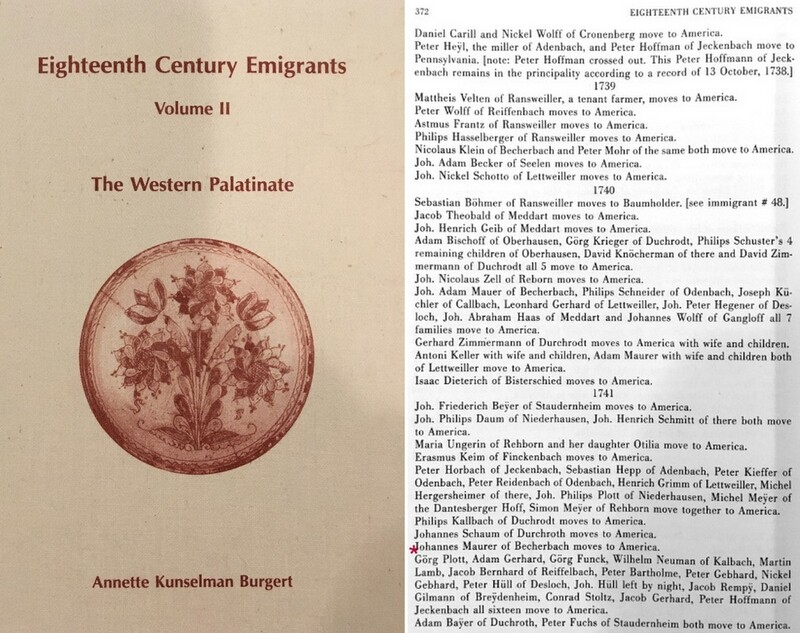 The information is published in "Eighteen Century Emigrants, Volume II, The Western Palatinate" by Annette Kunselman Burgert." Michael Palmer responded to my inquiry, "Callbach, in the 19th century Kreis Rockenhausen, in the Bavarian Rheinpfalz. It is 3 kilometers (about a 40 minute walk) east of Meisenheim, http://www.meyersgaz.org/place/10287019 (click on the map)." Bingo! On the 1741 Manumission registry, the village was spelled "Kalbach" (probably phonetically); however, the current spelling is "Callbach". Also, I asked Ruth Maves Roeder at my local Family Research Center to assist me in confirming this village of Callbach to be the Kalbach that Görg Plott came from. 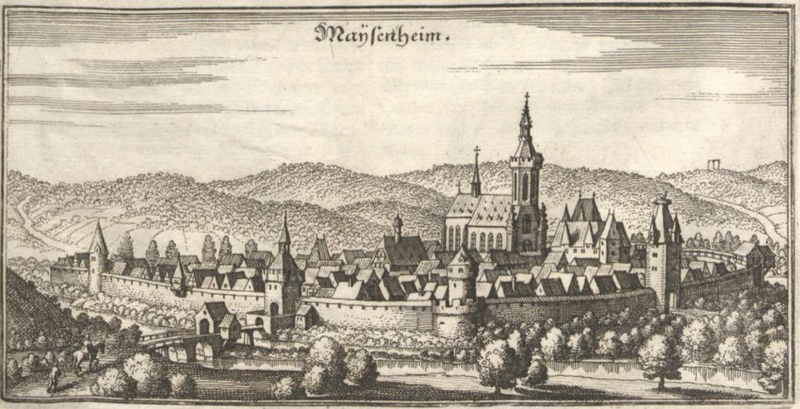 Ms. Roeder and I checked the villages that the other men on the list of sixteen to a local village of Meisenheim. The names of all the villages match up. I publicly thank Ms. Foster, Mr. Palmer and Ms. Roeder for their help in locating and confirming the correct Callbach for Görg Plott, Sr. We have never known this village information before. This is a big find! The above is a Google map of the Meisenheim area with the sixteen men's names seen in a "bracket" on the center of the 1741 Manumission register. Google map showing the location of Callbach within Germany and Europe. ​by Ralph Beaver Strassburger, LLD, Edited by William John Hinke, PHD, DD. 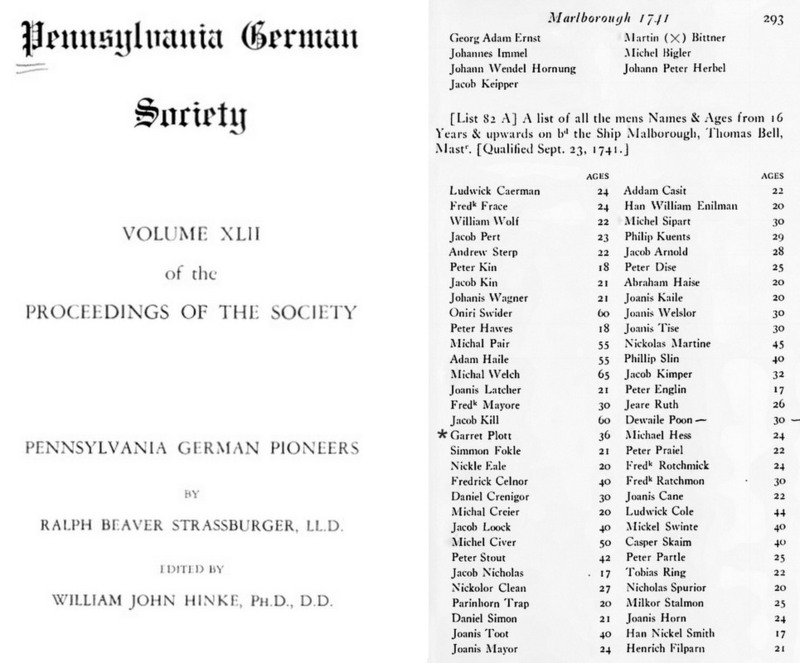 "Pennsylvania German Society, Volume XLII of the Proceedings of the Society, Pennsylvania German Pioneers", by Ralph Beaver Strassburger, LLD, Edited by William John Hinke, PHD, DD., which on page 293 was published, "[List 82 A] A list of all the mens Names & Ages from 16 Years & upwards on bd (birthday) the Ship Marlborough, Thomas Bell, Mastr. (Master, meaning Captain) [Qualified Sept. 23, 1741.]" The seventeenth name on the list was Garret Plott, which was a spelling error and should be Görg Plott. "Auswanderungen aus Rheinpfalz und Saarland im 18. Jahrhundert." by Werner Hacker​, which on page 596 was published, "11515 (Entry number 11515) Plott Görg, Kallbach (Village of Kallbach): Mm nach Am. (Meisenheim to America) - Sp B 2/4607:92v. (Landesarchivverwaltung Speyer Bestand (bandages refer to the finding books) B 2/4607:92v) = Mit ,,Marlborough (On the Ship Marlborough)" (Garret Plott, 36 J) an Phil. - SH I:293 (To Philidelphia in Strassburger & Hinke Book page 293). Am 1741 Am 1741 09 23 (America September 23, 1741)". Please notice that Werner Hacker acknowledges and reports in his listing that Görg Plott and Garret Plott are the same person. The error of "Garret" comes from the spelling error on the passenger list for the Ship Marlborough written by the ship's clerk.